Diagram of a Moberg volar advancement flap being used for a thumb tip defect. Diagram of a Littler neurovascular island flap for the coverage of a thumb tip defect. Markings for the pedicle of a first dorsal metacarpal artery flap. Markings for a free tissue transfer of great toe pulp to restore a volar thumb defect. Volar view of the clinical appearance of a Blauth type IV pouce flottant thumb. Congenital absence or traumatic injury to the thumb, resulting in a loss of its prehensile ability, significantly affects hand function. 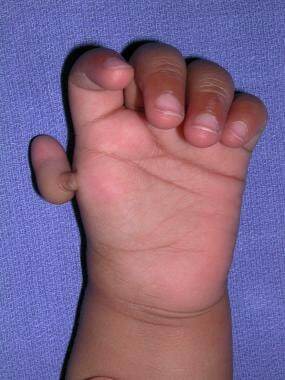 Traumatic loss, congenital absence, or hypoplasia of the thumb may result in a need for thumb replantation. The successful replantation of an amputated thumb restores the appearance of and some function to the injured hand. The procedure yields high satisfaction rates, whereas the functional outcome of other reconstructive methods tends to be less rewarding. The thumb's arterial supply is provided mainly through the terminal branch of the radial artery, the princeps pollicis. This artery crosses the first intermetacarpal space to run on the volar aspect of the MCP joint, where it divides into the ulnar and radial collateral arteries. The ulnar collateral artery is usually larger than the radial collateral artery, and it is often easier to repair during replantation. The median nerve and the superficial radial nerve supply sensation to the palmar skin and to the dorsal side of the thumb, respectively. Horta R, Barbosa R, Oliveira I, Amarante JM, Marques M, Cruz Reis J, et al. Neurosensible reconstruction of the thumb in an emergency situation: review of 107 cases. Tech Hand Up Extrem Surg. 2009 Jun. 13(2):85-9. [Medline]. Ray EC, Sherman R, Stevanovic M. Immediate reconstruction of a nonreplantable thumb amputation by great toe transfer. Plast Reconstr Surg. 2009 Jan. 123(1):259-67. [Medline]. Huguier PC. Du remplacement du pouce par son metacarpien, par l'agrandissement du premier espace interosseux. Arch Gen Med. 1874. 1:78. Nicoladoni C. Daumenplastik und organischer Ersatz der Fingerspitze (Anticheiroplastik und Daktyloplstik). Arch Klin Chir. 1900. 61:606-14. Buncke HJ Jr, Buncke CM, Schulz WP. Immediate Nicoladoni procedure in the Rhesus monkey, or hallux-to-hand transplantation, utilising microminiature vascular anastomoses. Br J Plast Surg. 1966 Oct. 19(4):332-7. [Medline]. Cobbett JR. Free digital transfer. Report of a case of transfer of a great toe to replace an amputated thumb. J Bone Joint Surg Br. 1969 Nov. 51(4):677-9. [Medline]. [Full Text]. Morrison WA, O'Brien BM, MacLeod AM. Thumb reconstruction with a free neurovascular wrap-around flap from the big toe. J Hand Surg [Am]. 1980 Nov. 5(6):575-83. [Medline]. Wei FC, Chen HC, Chuang CC, et al. Microsurgical thumb reconstruction with toe transfer: selection of various techniques. Plast Reconstr Surg. 1994 Feb. 93(2):345-51; discussion 352-7. [Medline]. Buck-Gramcko D. Pollicization of the index finger. Method and results in aplasia and hypoplasia of the thumb. J Bone Joint Surg Am. 1971 Dec. 53(8):1605-17. [Medline]. Littler JW. On making a thumb: one hundred years of surgical effort. J Hand Surg [Am]. 1976 Jul. 1(1):35-51. [Medline]. Heitmann C, Levin LS. Alternatives to thumb replantation. Plast Reconstr Surg. 2002 Nov. 110(6):1492-503; quiz 1504-5. [Medline]. Littler JW. On the adaptability of man's hand (with reference to the equiangular curve). Hand. 1973 Oct. 5(3):187-91. [Medline]. Napier JR. The prehensile movements of the human hand. J Bone Joint Surg Br. 1956 Nov. 38-B(4):902-13. [Medline]. [Full Text]. Kleinman WB, Strickland JW. Thumb reconstruction. Green DP, ed. Operative Hand Surgery. 2nd ed. New York, NY: Churchill Livingstone; 1999. 2068-170. Morrison WA. Thumb reconstruction: a review and philosophy of management. J Hand Surg [Br]. 1992 Aug. 17(4):383-90. [Medline]. Cheng G, Fang G, Hou S, et al. Aesthetic reconstruction of thumb or finger partial defect with trimmed toe-flap transfer. Microsurgery. 2007. 27(2):74-83. [Medline]. Matev IB. Thumb reconstruction through metacarpal bone lengthening. J Hand Surg [Am]. 1980 Sep. 5(5):482-7. [Medline]. Woo SH, Lee GJ, Kim KC, et al. Immediate partial great toe transfer for the reconstruction of composite defects of the distal thumb. Plast Reconstr Surg. 2006 May. 117(6):1906-15. [Medline]. Moberg E. Aspects of sensation in reconstructive surgery of the upper extremity. J Bone Joint Surg [Am]. 1964 Jun. 46:817-25. [Medline]. Wang H, Yang X, Chen C, Wang B, Wang W, Jia S. Modified Littler flap for sensory reconstruction of large thumb pulp defects. J Hand Surg Eur Vol. 2018 Jun. 43 (5):546-53. [Medline]. Foucher G, Khouri RK. Digital reconstruction with island flaps. Clin Plast Surg. 1997 Jan. 24(1):1-32. [Medline]. 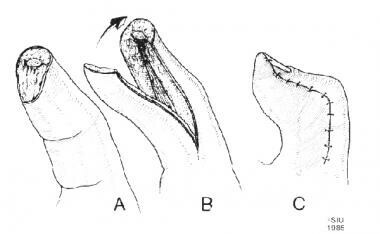 Adani R, Mugnai R, Petrella G. Reconstruction of Traumatic Dorsal Loss of the Thumb: Four Different Surgical Approaches. Hand (N Y). 2017 Oct 1. 1558944717736396. [Medline]. Gu JX, Pan JB, Liu HJ, et al. Aesthetic and sensory reconstruction of finger pulp defects using free toe flaps. Aesthetic Plast Surg. 2014 Feb. 38(1):156-63. [Medline]. Lister G. The choice of procedure following thumb amputation. Clin Orthop Relat Res. 1985 May. (195):45-51. [Medline]. Broadbent TR, Woolf RM. Thumb reconstruction with contiguous skin-bone pedicle graft. Plast Reconstr Surg. 1960. 26:494-49. Emerson ET, Krizek TJ, Greenwald DP. Anatomy, physiology, and functional restoration of the thumb. Ann Plast Surg. 1996 Feb. 36(2):180-91. [Medline]. Goldner RD, Howson MP, Nunley JA, et al. One hundred eleven thumb amputations: replantation vs revision. Microsurgery. 1990. 11(3):243-50. [Medline]. Reid DA. Reconstruction of the thumb. J Bone Joint Surg Br. 1960 Aug. 42-B:444-65. [Medline]. [Full Text]. Cheema TA, Miller S. One-stage osteoplastic reconstruction of the thumb. Tech Hand Up Extrem Surg. 2009 Sep. 13(3):130-3. [Medline]. Gilbert A. Composite tissue transfers from the foot: anatomic basis and surgical technique. Daniller AI, Strauch B, eds. Symposium on Microsurgery. St Louis, Mo: CV Mosby; 1976. Wei FC, Chen HC, Chuang CC, et al. Reconstruction of the thumb with a trimmed-toe transfer technique. Plast Reconstr Surg. 1988 Sep. 82(3):506-15. [Medline]. Shin AY, Bishop AT, Berger RA. Microvascular reconstruction of the traumatized thumb. Hand Clin. 1999 May. 15(2):347-71. [Medline]. Kovachevich R, Giuffre JL, Shin AY, Bishop AT. Immediate Great Toe Transfer for Thumb Reconstruction After Tumor Resection: Report of 3 Cases. Ann Plast Surg. 2016 Mar. 76 (3):280-4. [Medline]. Leung PC. Thumb reconstruction using second-toe transfer. Hand Clin. 1985 May. 1(2):285-95. [Medline]. Valauri FA, Buncke HJ. Thumb and finger reconstruction by toe-to-hand transfer. Hand Clin. 1992 Aug. 8(3):551-74. [Medline]. Weinzweig N, Chen L, Chen ZW. Pollicization of the mutilated hand by transposition of middle and ring finger remnants. Ann Plast Surg. 1995 May. 34(5):523-9. [Medline]. Letac R. Pollicization of the ring finger. J Int Coll Surg. 1954 Dec. 22(6, Part 1):649-55. [Medline]. Littler JW. 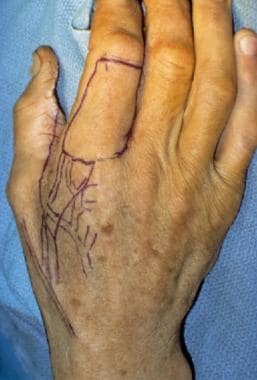 Reconstruction of the thumb in traumatic loss. Converse JM, ed. Reconstructive Plastic Surgery. 2nd ed. Philadelphia, Pa: WB Saunders; 1977. Reid DA. Thumb reconstruction in the mutilated hand with special reference to pollicization. Campbell Reid DA, Gosset J, eds. Mutilating Injuries of the Hand. New York, NY: Churchill Livingstone; 1979. Brunelli GA, Brunelli GR. Reconstruction of traumatic absence of the thumb in the adult by pollicization. Hand Clin. 1992 Feb. 8(1):41-55. [Medline]. Stern PJ, Lister GD. Pollicization after traumatic amputation of the thumb. Clin Orthop Relat Res. 1981 Mar-Apr. (155):85-94. [Medline]. Buncke HM, Valauri FA, Buncke GM. Great toe-to-hand transfer. Meyer VE, Black MJ, eds. Microsurgical Procedures: The Hand and Upper Limb. New York, NY: Churchill Livingstone; 1991. Cong HB, Chang SM, Qiao YP, et al. One-stage reconstruction of complicated thumb injury with combination of microsurgical transplantations. Microsurgery. 2007. 27(3):181-6. [Medline]. Rosson GD, Buncke GM, Buncke HJ. Great toe transplant versus thumb replant for isolated thumb amputation: critical analysis of functional outcome. Microsurgery. 2008. 28(8):598-605. [Medline]. Chung KC, Wei FC. An outcome study of thumb reconstruction using microvascular toe transfer. J Hand Surg [Am]. 2000 Jul. 25(4):651-8. [Medline]. Manske PR, Rotman MB, Dailey LA. Long-term functional results after pollicization for the congenitally deficient thumb. J Hand Surg [Am]. 1992 Nov. 17(6):1064-72. [Medline]. Aliu O, Netscher DT, Staines KG, Thornby J, Armenta A. A 5-year interval evaluation of function after pollicization for congenital thumb aplasia using multiple outcome measures. Plast Reconstr Surg. 2008 Jul. 122(1):198-205. [Medline]. Marking for the radial incision of a Moberg flap. Moberg flap raised just above the level of the flexor pollicis longus tendon sheath. Markings for a volar advancement flap with modification of the incision at the base to allow closure in V-Y fashion after distal phalanx shortening. Radial view of the markings for a volar advancement flap with modification of the incision at the base to allow closure in V-Y fashion after distal phalanx shortening. Volar advancement flap with modification of the incision at the base to allow closure in V-Y fashion after distal phalanx shortening. Thumb tip defect that is amenable to closure with a Moberg volar advancement flap. Incision marking for a Moberg flap. The neurovascular bundle should be kept with the volar advancement flap. Bridging vessel to the neurovascular bundle on a volar flap. Flexion at the interphalangeal joint to allow closure. Volar view of the closure of a thumb defect with a Moberg volar advancement flap. Radial view of the closure of a thumb defect with a Moberg volar advancement flap. Intraoperative view of a Littler neurovascular island flap. Postoperative view of a Littler neurovascular island flap. Second postoperative view of a Littler neurovascular island flap. Dissection for a first dorsal metacarpal artery flap. Isolation of the pedicle for a first dorsal metacarpal artery flap. Postoperative appearance of a thumb tip after coverage with a first dorsal metacarpal artery flap. Second view of the postoperative appearance of a thumb after coverage with a first dorsal metacarpal artery flap. Free tissue transfer of great toe pulp to restore a volar thumb defect. Postoperative view after a free tissue transfer of great toe pulp to restore a volar defect. Dorsal view of the clinical appearance of a Blauth type IV pouce flottant thumb. Pollicized index finger for thumb reconstruction at 2 weeks after surgery. Functional use of a pollicized index finger at 8 weeks after surgery.